Looking at news about earth’s climate, it seems all but confirmed that we are on a trajectory towards a warmer, less-predictable future. According to scientists from NASA, the National Oceanic and Atmospheric Administration, the Hadley Center, and the Japan Meteorological Association, 2014 was the hottest year on record. This news would be easier to stomach if climate scientists weren’t already projecting 2015 and 2016 to significantly surpass 2014. We are coming to a point where world leaders need to agree on a comprehensive plan to address climate change. As important as renewable energy is to long term sustainability, there are many complementary ways to reduce the impact that “business as usual” has on the environment. One area that requires more attention is how the commercial sector can reduce the impact of the embodied carbon of materials that are used and discarded to construct and operate buildings. Owners of commercial buildings and their facilities managers need to care about the embodied carbon in their products because making, using, and disposing these items produces almost 50 million tons of greenhouse gas emissions in the UK alone. Globally, buildings contribute to 40% of energy use, and are responsible for one third of greenhouse gas emissions – most of which can be attributed to the commercial sector. Simply put, embodied carbon represents the greenhouse gases emitted from the manufacturing, transporting, installing, and disposing of building products. These products include the materials used to construct the building, and the furniture and equipment used by the people in the building. This helpful pie chart shows the relative percentages of embedded carbon for some of these products. So all of the concrete, wood and metal that make up the skeleton of a building, or the plastic and nylon found in the hundreds of chairs that populate an office space, represent a tremendous amount of carbon emissions. And how businesses manage that embodied carbon matters over the long term. The focus on energy consumption only solves part of the problem. 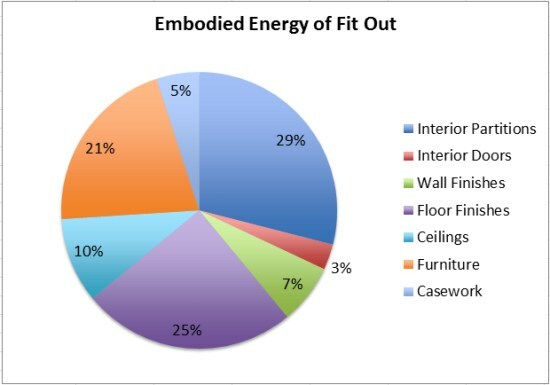 Reducing energy consumption does not address the carbon generated from office renovations and moves, which pave the way for newer and better, well, everything—from office furniture to supplies to entire wall systems. Office transitions, moves, and renovations compel businesses to tear down walls, and purchase new furniture and equipment and send the old, no-longer-needed ‘stuff’ to the landfill. Some corporations may not have a say in how these products are produced, but they do have a say in how they can be approached at their end-of-life. The good news is that there are options available to the commercial sector to help mitigate the affect of embodied carbon. We just need the decision makers to become aware of these options (especially in North America) and build them into their business-as-usual approach. Aside from the environmental imperative, there is the opportunity for cost-savings and job creation, improved efficiency, and even brand-building. In-kind donation, for example, is a great way for corporations to reduce the emissions from their products, avoid the cost of landfill fees, and, as a bonus, engage their community in a meaningful way. Rather than send their excess assets to the dump, a business can donate them to local non-profit organizations that need the boost to their operations and workplace. This is a method that can benefit everyone: businesses, people, and the planet. That embodied carbon is the ‘silent threat’ to the environment—especially in the commercial sector—is clear. All of the data points to a growing issue that is not getting the attention it deserves. The commercial sector will never stop producing stuff it no longer needs and must eventually be remove from office buildings — and this isn’t a bad thing. Once the decision-makers recognize the affects of embodied carbon, they can then realize there’s an opportunity to fulfill their corporate social responsibility goals by keeping their excess ‘stuff’ out of the landfill and instead, using it to invest in their community. The opportunity to do something special is there, now we just need to build awareness and act upon it.